Insight Automation offers PulseRoller products as well as many other component accessories for Low Voltage Motor Driven Roller Conveyors. 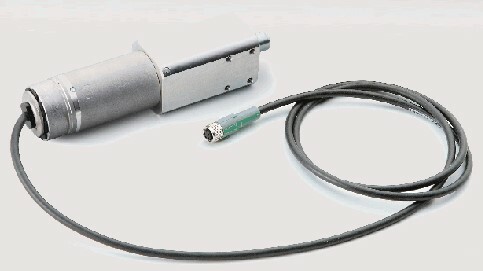 PulseRoller is the brand name for a family of 24 volt DC, Motorized Drive Roller products and controls. PulseRoller brand consists of a variety of motor drive rollers of various diameters and configurations, GearDrive motors, the most advanced Ethernet networked drive controllers, and various other components required to assemble and implement motor driven roller conveyors and system. Our advanced drive controls combines a simple ZPA solution out of the box with hooks to connect a PLC over single Ethernet line to give you complete control over your low voltage accumulation conveyor system. ConveyLinx is a zero pressure accumulation controller for either two Senergy Motors or Pulse Gear Drives. This is accomplished by connecting two drive motors, two sensors, supplementary I/O, and an Standard Cat5 Shielded ethernet cable to the next downstream card. ConveyLinx offers mostly the same as our standard conveylinx with some exciting changes. 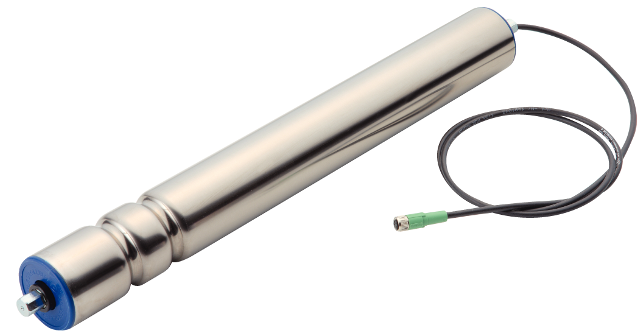 The new design is UL and IP54 Rated which uses robust M8 4-pin connectors for the motor and sensor connections. ConveyLinx Ai2 connects to any Drives product with the Ai designation which now has intellegence inside the drives. ConveyLinx Ai2 also comes in a much more compact design allowing it to be installed in just about any conveyor frame. MotionLinx Ai is PulseRollers's EtherCat two zone high speed controller. Designed for a wide variety of applications in the conveying and machine building industries, it can drive two Senergy Ai or PGD Ai drives. A maximimum of four sensors can also be connected via two M8 Connectors. 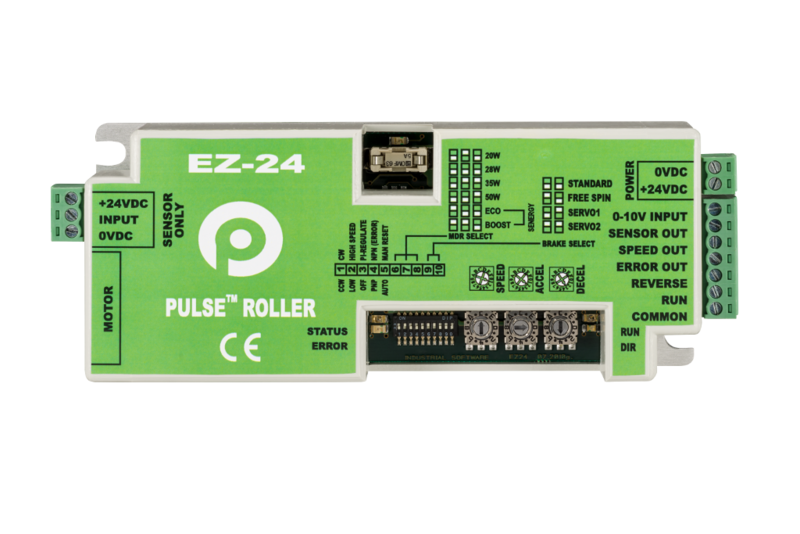 EZ-24 modules provide digital I/O run on demand control for all PulseRoller motor rollers (20W, 28W, 35W, 50W and Senergy ECO mode and Senergy Boost mode) Forward, Reverse and Error digital signals as well as an Analog input for speed input and pulsating output for speed reference output. EQube is an economical single motor, drive controller module for Senergy Motors. EQube provides control for the motor in ECO mode. Speed, acceleration & deceleration are adjustable using combinations of DIP switches on the module. Motors may be run ClockWise (CW) or Counter ClockWise (CCW) using digital inputs to the controller terminals. A motor/module error output is available for connection to user controls. EQube Ai is an economical single motor, drive controller module for Senergy Motors. EQube Ai provides control for the motor in ECO mode. Speed, acceleration & deceleration are adjustable using combinations of DIP switches on the module. 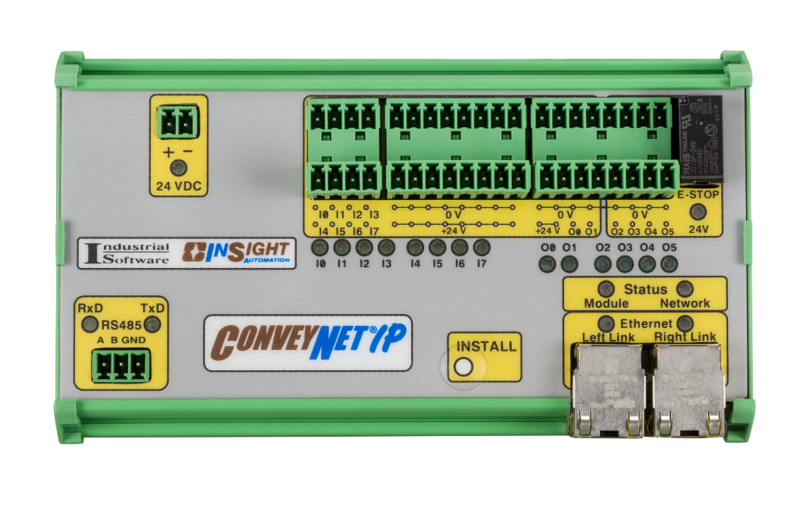 ConveyNetIP is a Digital I/O module equipped with EthernetIP, ModbusTCP, and ProfiNet for use with the ConveyLinx control architecture, general remote I/O, or as a standalone PLC. Eight inputs and six relay outputs allow you to place this module right in series with a ConveyLinx system for additional I/O points. 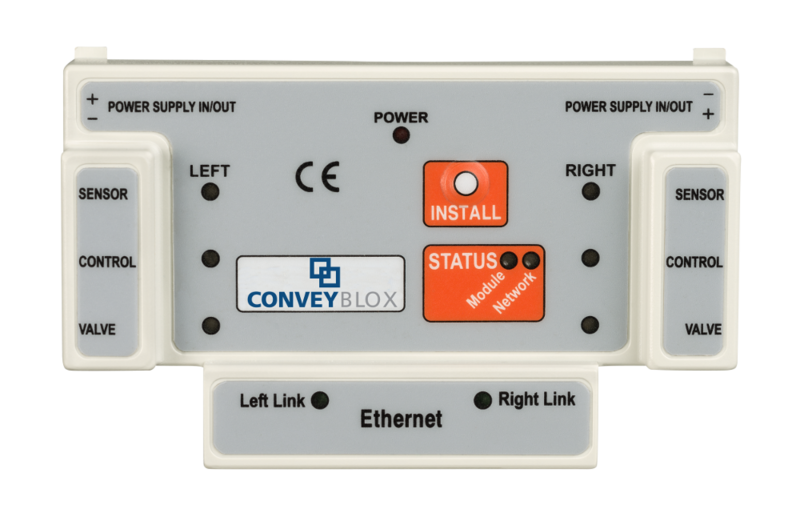 ConveyBlox is nearly identical to its sister product ConveyLinx, with one very important difference. This significant difference makes it a whole new product line. Instead of driving commutating low voltage motors, ConveyBlox is equipped with two discrete outputs for direct connection to air solenoids, motor starters, or VFD’s and uses the same Zero Pressure Accumulation logic with discrete outputs controlling air or AC motors. 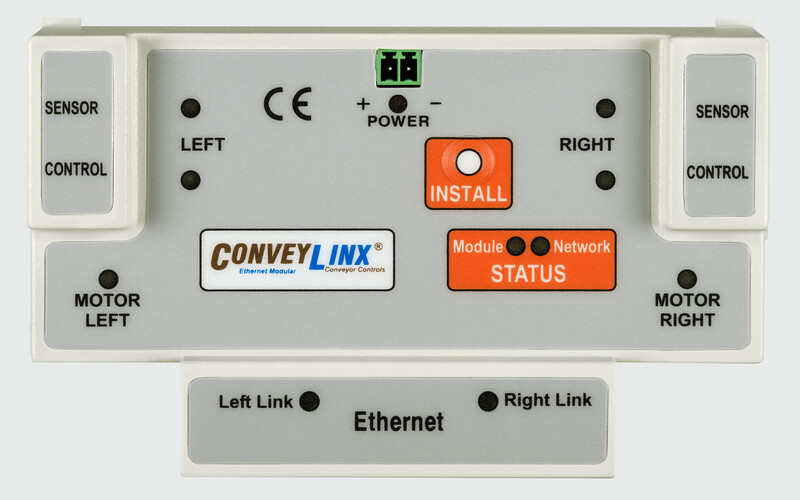 ConveyLinx IO offers a compact low profile design with 8 fully configurable inputs and outputs. The output is rated at 400mA which should be sufficient for most motorized drive roller I/O devices and ofers a seperate power supply for outputs for Emergency stop requirements. 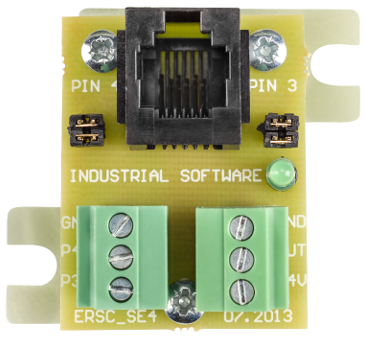 As with all of our latest Ai controllers this module has an IP54 rating, CE, and ETL certified to UL standards. MotionLinx IO is PulseRollers's field I/O device for EtherCAT high speed bus sytems. It's the perfect compliment to the MotionLinx Ai product with 8 fully configurable I/O points. Configuration is accomplished via Service Data Objects (SDO) and no proprietary software is required. This product will seamlessly integrate into any EtherCAT installation offering great benefits and saving you on your bottom line. PulseRoller Drives offers the highest standard in quality and reliable performance. Every day hundreds of thousands of cartons, totes and pallets are driven by our selections of Motor Rollers and Drives. Robust performance suitable for speeds between 6 to 969 fpm and starting torque up to an amazing 215 in/lbs. The Senergy unique gearbox design and powerful brushless DC motor provides an extremely efficient means of delivering an amazing amount of torque and speed with the smallest amount of energy. Typically used in conveyors for Zero Pressure Accumulation or roller transportation. Senergy® Roller gearbox selection contains only 11 gearbox combinations to make ordering and keeping an inventory much more manageable. 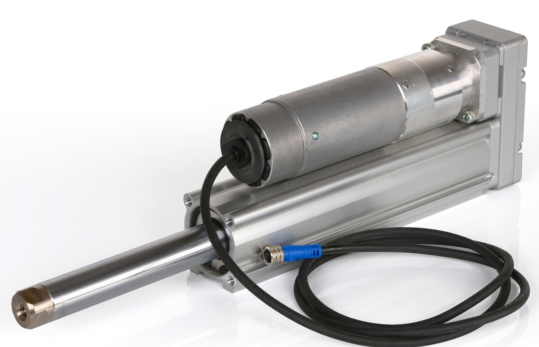 Senergy Ai is the first motor roller of it’s kind using a reliable and proven M8 connector which is then connected to an external control of your choice. (Patent Pending) The hall-effect signals are digitally coded inside the motor by a µ-controller, which makes it possible to communicate precision motor control through only one pin to an external controller. The u-Controller also digitally codes through the same pin the motor temperature, run-time, gear box information, serial number and other information. PulseRoller’s Pulse Geared Drive was designed for those applications that require Senergy’s awesome power, efficiency and reliability in an extremely compact form while still delivering the outstanding features of PulseRoller controls capabilities. Imagine the form factor of a high voltage AC Motor/Gearbox combination in a much more compact low voltage version. Pulse Geared Drive with Advanced intelligence. Get all the same great features, the same form factor and now with much more. PGD Ai is the first drive of it’s kind using a reliable and proven M8 connector which is then connected to an external control of your choice. (Patent Pending) The hall-effect signals are digitally coded inside the motor by a µ-controller, which makes it possible to communicate precision motor control through only one pin to an external controller. The u-Controller also digitally codes through the same pin the motor temperature, run-time, gear box information, serial number and other information. 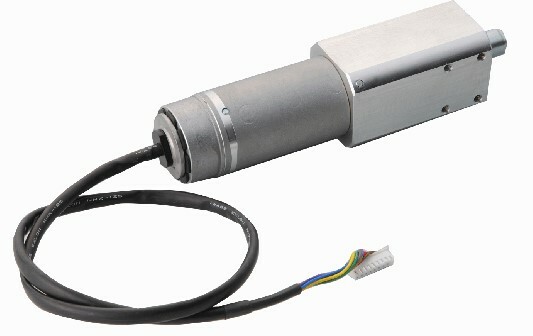 PulseRoller's latest product allow you to use a Senergy's awesome low voltage brushless dc motor torque to control Actuators. 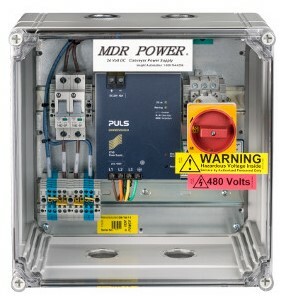 The PMD Ai has the same form factor of a 100 Watt AC servor, but now have in a DC voltage with nearly just as much precision at half the cost. The PMD Ai comes with a Robust M8 4Pin connector with Advance intelligence inside. The hall-effect signals are digitally coded inside the motor by a µ-controller, which makes it possible to communicate precision motor control through only one pin to an external controller. The u-Controller also digitally codes through the same pin the motor temperature, run-time, gear box information, serial number and other information. PulseRoller’s Pallet Rollers were designed to replace the AC Motor mounted to the side of Pallet Conveyor. Pulse Pallet Rollers can reach up to 70" betwen frame dimensions and drive up to 2700lbs of weight. Speeds from 10M/ minute to 25M/ minute. Pulse Pallet will use ConveyLinx or EZ24 high torque cards to provide you with the most current for the heavier loads. The Pulse Divert Unit is a well proven right angle transfer design using robust and reliable technology. Every Pulse Divert Unit is specifically configured based upon your needs and your unique application. The PDU 90 will fit your application every time. Zone presence sensors for your Accumulation Conveyor. There is no need to pay more for Sensor features that are not required on Zero Pressure Conveyor. 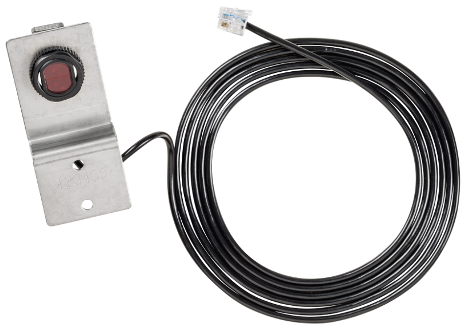 Featuring a Sensing distance of nearly 5’-0”, an NPN signal alert when parts are present, and an RJ12 connection at the end for quick connections to the Controls Architectures, you can rely on ConveySense. 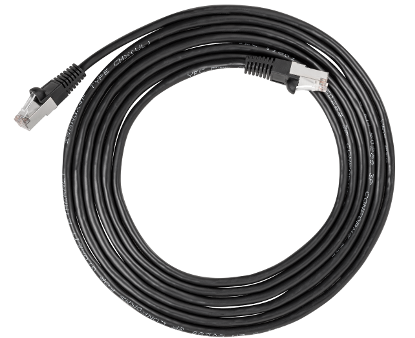 Select the cable length of your choice, and choose Diffuse or Retro-Reflective. We offer a wide range of sizes of Extension cables to extend from our range of Controllers to the Brushless DC Drive. The low cost Cables have been tested and approved for use with all of our Controls. 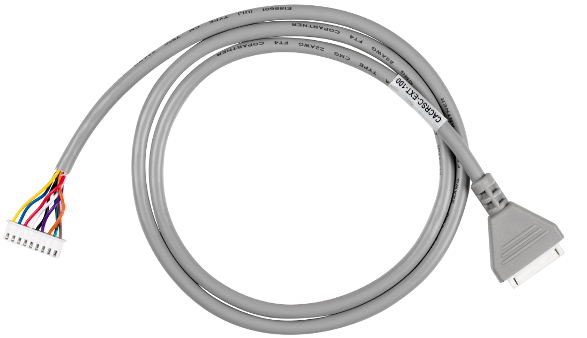 We offer a wide range of sizes of Shielded Ethernet Cables to use with our “Networked Controller” ConveyLinx. The low cost Ethernet Cables have been tested and approved for use with all of our Controls. All cables are crossover sheilded cables with a ground. Insight can offer 1.9" Idlers to match our PulseRoller drive selection upon request. With thousands of Motor Roller's sold many customers have found it benificial to purchase there Idlers through us as well to keep from having to purchase from multiple vendors. We have several vendors that we can purchase the idlers you request. Insight is the authorized reseller in the United States for Autem's PLC Analyzer Pro 5. 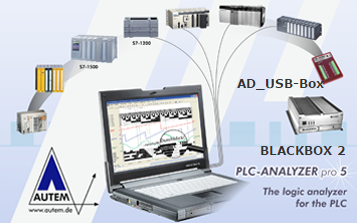 The software sytem is for logic analysis and acqusition of recorded data from a PLC. Acquisition representation and evaluation of PLC signals such as inputs, outputs, and other bits is now very easy. The only display now makes it possible to observe in real time while you're recording as well.